The roots of the modern Fox Cutlery Company started to form in 1977 after its founder Oreste Frati started the company after years of experience in the commercial cutlery industry. The city of Maniago in Italy is (and has been for a very long time) known for its steel blade manufacturing, and by most standards would be very comparable to the city of Solingen, Germany which is perhaps the most famous knife-making city in the world. 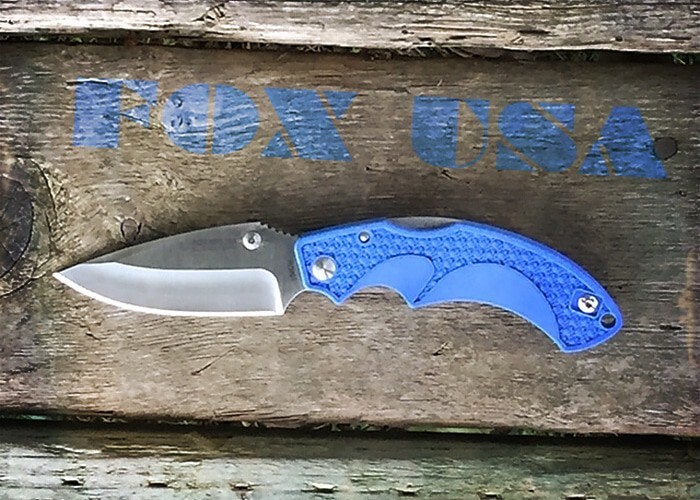 Fox’s EDC knives appear to carry on a fairly high standard of knife quality worthy of the company’s roots. While I do not approach every knife review with a mind to promote and glow about the product, I couldn’t help but assume the high level of quality of the knife based on BladeHQ’s retail price of nearly $150. However, it’s worth a mention that as of the writing of this article, the knife is available for LESS THAN HALF that price! A cursory glance at the knife right out of the box might lead you to believe the construction is a bit less substantial than you might like. The FRN handle is very light and does not scream “toughness”. However, the second you flip open the blade, you’ll notice that all the weight is in the heavy, thick blade. 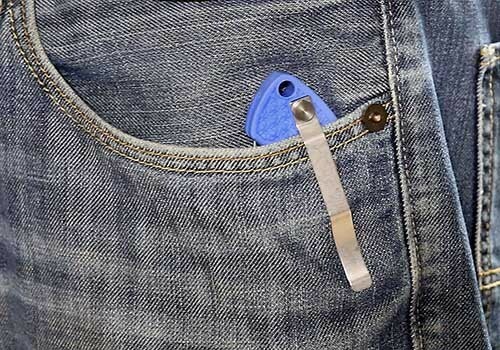 The loud “click” upon engaging the lock will get your attention, and after about 15 seconds of turning it over in your hand, you’ll notice it’s a pretty substantial knife built for slightly heavier duty EDC functions. In fact, because of the size of the blade and the bigger belly than most, this EDC can function as a hunting knife if necessary. 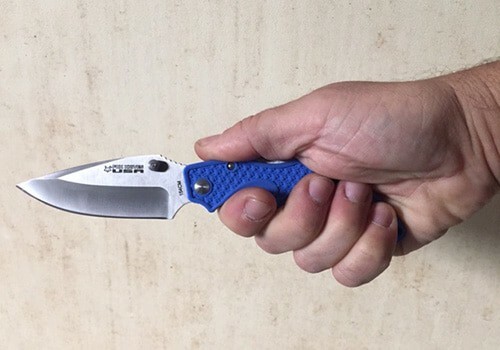 Overall, this is no slouch when it comes to toughness expected from an EDC. That’s why the MSRP is somewhere upwards of $140-ish. Out of the box, like most blades, it’s extremely sharp. For the first time in longer than I can remember, I just touched the point with my thumb and it actually broke the skin! The overall look of the blade is not unlike a spyderco’s very distinctive blade shape and style. It’s tall top to bottom, but unlike a Spyderco, it has quite a pronounced swedge (tapered area) along the top of the blade. 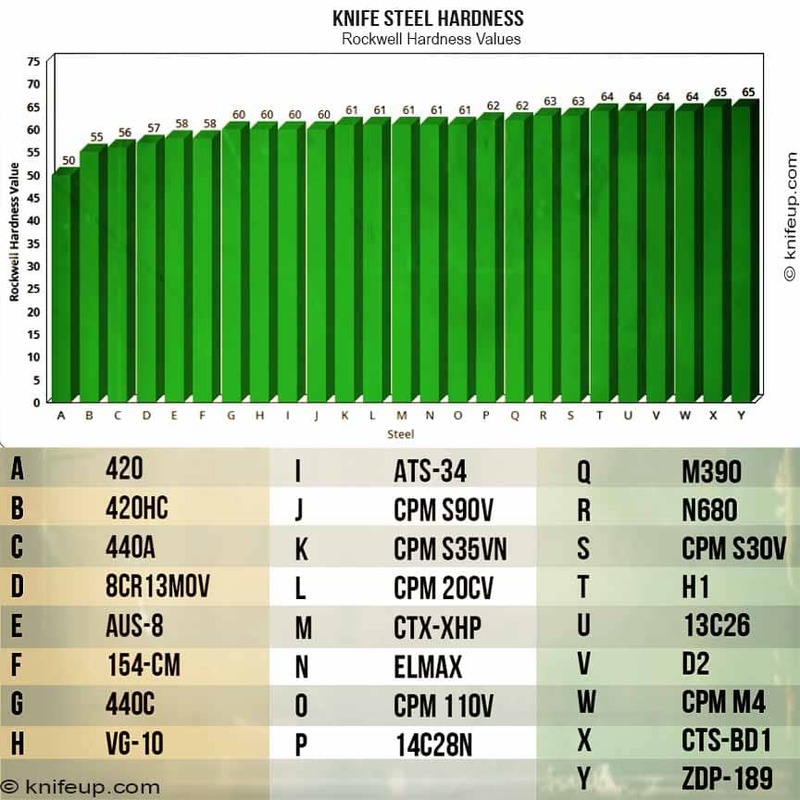 The 154 CM steel is more than satisfactory for most uses, and helps maximize the rust-resistance of the blade. Obviously, some thought has gone into finger placement on the blade. An oversized choil integrates nearly seamlessly with the handle to offer exceptional comfort and “choking up” ability without risking a cut on your index finger. Gimping on the top of the blade functions exactly like a thumb rise, but it’s on the blade rather than the handle. The blade features a non-adjustable thumb stud on either side which is a standard feature on most EDCs that don’t have a hole in the blade for a thumb grip to aid in opening. There is no excessive gimping on either the blade or the handle. The handle is one of the very thinnest we’ve seen, and if you know anything about me, you’ll know I REALLY like that. It’s only 3/8″ thick! 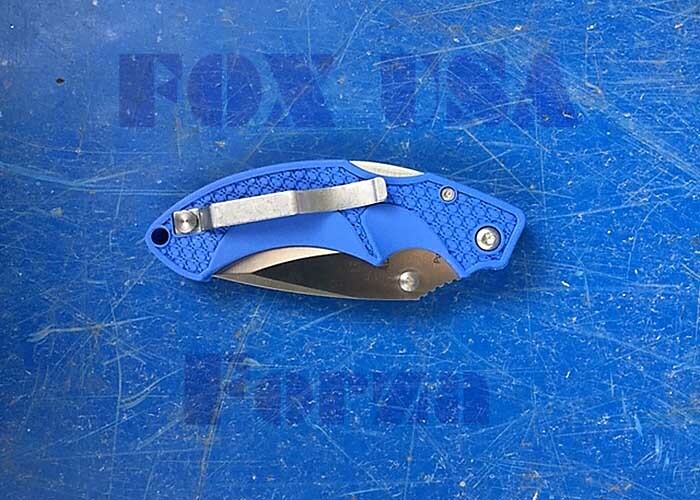 In spite of this incredibly thin profile, Fox has managed to incorporate a thin, metal liner inside the handle. 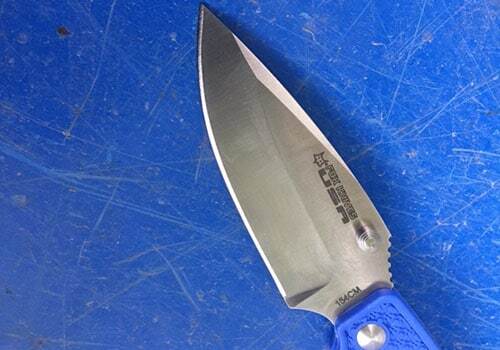 It would have been easier to just let the FRN handle material serve as the sole reinforcement, but for a knife over $100, it should have a steel liner. Much like the blade design, the handle shows that some effort has gone into the ergonomics and grip of the handle. 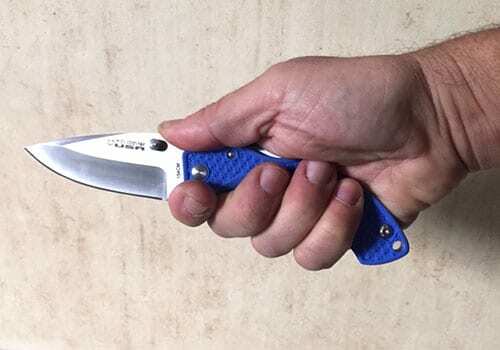 It’s excessive curve and finger divots make it a pistol grip style which maximizes comfort in your hands and makes this knife a very easy knife to play with while watching TV or even reading (I know because I’ve done it!). The Lock Back is mechanism is (like most lock backs) very stiff and does not allow for easy one-handed opening. The lock actually pushes against the blade through the whole opening range of motion which means it will necessarily make it feel much stiffer while opening or closing, but the blade/knife feel VERY sturdy once opened. The clip is reversible from one side of the blade to the other, but there is no choice to have a tip down carry. You’ll get only a tip up option. If we could offer a criticism about this knife, it would definitely be the clip. The clip seems to be an element that was ignored by Fox in its design. While functioning very well, it ranks ZERO on a scale of 1 to 10 for design. The finish on the clip is lackluster (figuratively and literally). It’s not shiny like polished steel or chrome but a bit tarnished looking. It has no creative profile and that’s especially wrong given the length of the clip (close to 2-3/4″). They could have included a bit of a width change or engraving for style, but it really looks like an afterthought which has tons of potential, but the ball was dropped! while functionally adequate, the aesthetics and styling of the clip is an abysmal failure! In spite of the clip criticism, this is arguably the best deal anywhere online for an EDC knife which is quite at home in the bush, the hunt camp, or in your pocket every day. In your hand, it feels very much like a heavy-duty EDC or a light duty hunting knife. The thinness of the entire package will be appreciated during pocket carry, and the handle is about as comfortable in your grip as any EDC on the planet with a blade even close to being this thin. The 2.7 Oz weight is especially incredible when you consider that not only is that weight lighter than average for an EDC, but this knife is actually heavy duty oriented! Considering the sale price of HALF the original value (while it’s still available), we would rate this a strong buy. If it sold for the original price of $140, I would be able to find a better knife (if only barely) with a higher carbon content and a few other features that would make you smile. But, that ain’t the case here, so get this while it’s still available at BladeHQ.